I was determined to have a specially designed bag for our trip to Paris. The key feature being ‘impossible to pickpocket’. 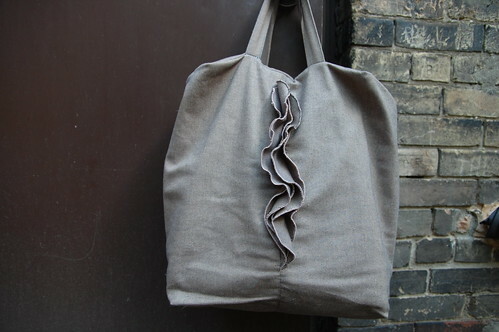 I was heavily inspired by the Leather Ruffle Bag by Tanaz Ghaffari. I especially liked how the bag closed with a zipper that sits under your arm as you held the bag on your shoulder. And of course, it’s hard to resist anything with ruffles. For supplies, I decided to head to the Leather & Sewing Supply Depot (7 Vanauley Street, Toronto, ON – 416-913-4868). It was the first time that I had been there, but they have an incredible selection of zippers and I was looking for some heavy duty metal ones. 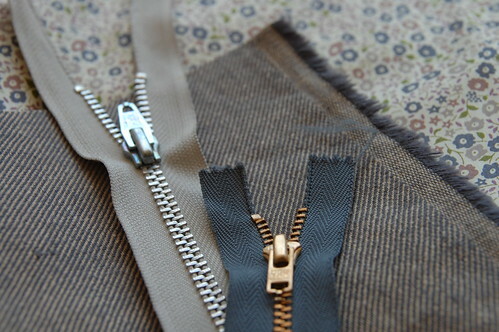 I also happened to find the cool taupe-y denim that I used for the outside of the bag. In my limited bag designing experience, I’ve found it really helpful to create a mini mock up version, in order to work out any problems with the pattern and figure out the construction. It’s a great way to test out your pattern quickly without using too much fabric. My mock up looked good but when I blew up the pattern and cut out the fabric, the bag was way more over-sized than I wanted. As I went along, I just adjusted the pattern to make it work. The bag is lined with Liberty of London Tana Lawn Cotton in the Fairford print. I have to say that it is delightful to sew with. Every time my fingers ran against the fabric I had a little thrill. This sweet little floral goes perfectly with the denim I used. 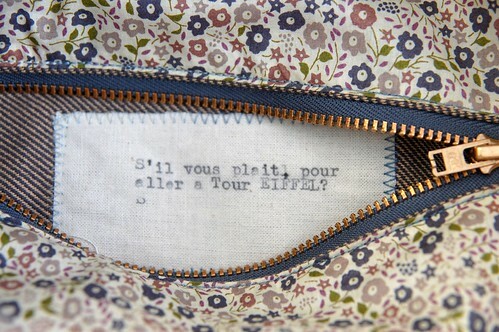 There is a little zippered pocket sewn into the lining and inside the pocket is a special typewritten label in French. For the trip, I left my big wallet at home and only carried my snap coin purse. The snap coin purse was kept in the inside zippered pocket. Thus, any pickpocket would have to get under my arm to unzip the first zipper and then unzip another zipper to get to my money. My Euros were well protected! 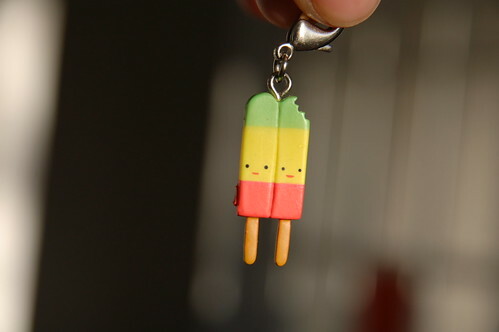 I added the cutest popsicle zipper pull from Magic Pony as a final touch. The bag is not the most refined design, but it fit all my requirements. It was big enough to carry around my camera, a sweater and anything else we needed for our days around Paris. I was also able to fit everything I bought into it while we were shopping, so I only ever had to carry the one bag. Lastly, my money was secure without me having to tape it to my body. The last photo here was taken at Pearson Airport waiting for our flight to Paris. Perfect Bunny did join us in Paris, but this was the only shot I got of her! That zipper placement was a great idea for preventing pickpocketing! My birdie sling is getting so dirty… It may be time to make myself a new bag. I love the rectangular top you made for this one. How was this bag when you traveled? anything you’d change in the design if you made it again? haha. 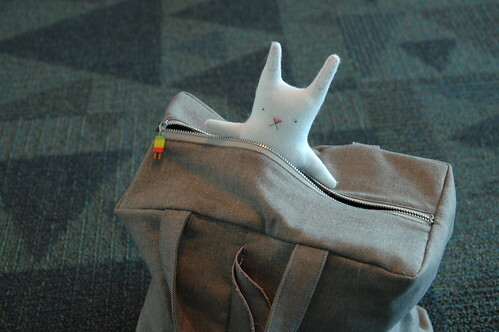 i’m so glad you were able to use the zipper pull! love the ruffle. nice design. Absolutely adorable! You are very clever! Nice! I really like the rectangular top. 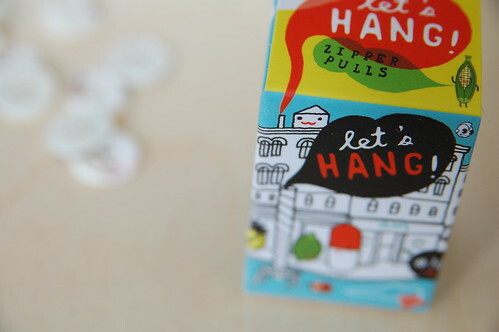 I love the bag design, and the zipper pull, so cute! i love how you put such care and thought in the little details! This is fantastic! I love anything and everything with Liberty of London. I used all of my fairford print up long ago. It’s very versatile. Really nice. You have classy style (is that possible?!). can you tell me what is the stich you use for the border of the flounces, in front on the bag? Hi Geraldine! 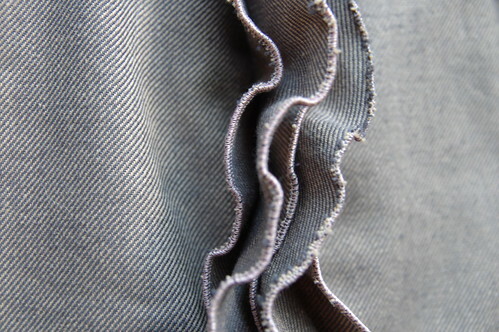 I used a serger on a rolled hem setting to make that stitch. It’s very pretty as a decorative finish.